We're still closely monitoring for bugs and issues which Nintendo Switch players may be seeing. We're going to try updating things inside this thread to make it easier on everyone to get an overview of where things are at. Here's a list of issues which we've identified since launching on the Nintendo Switch. If you're having a problem in this list marked 'need more details' it would be helpful to provide more info - we're still working on reproducing/determining a cause for these issues. If your issue isn't listed here then please be as detailed as possible reporting it so we can review. Always check you have the newest game/system updates before reporting an issue to make sure it hasn't already been fixed! (Fixed) Fixed issue that created the unintended ability to skip saving at night with a well-timed button press. (Fixed) Fixed the inability of players to drop items without deleting them when using the cursor mode that snaps to UI elements. (Fixed) The game now detects Simplified / Traditional Chinese environments on first start up and defaults to the Simplified Chinese localisation instead of English. (Fixed) The new Switch video recording feature is now supported. The plan right now is to release a patch ASAP to address as many of these issues as we can, but we'll need player reports to be as detailed as possible in order to properly identify/fix these bugs. Our priority obviously are bugs which impact gameplay like crashes. If you're reporting a bug which was originally reported outside the forums (I'm looking at you @Typhoon haha) please make sure to add a link to the original post - we may need to contact that player directly for more details. Workarounds: There are a few bugs listed here which can be worked around by disabling the option 'Use Controller-style menus' under game options. These include 'Unable to open certain items in the crafting menu' and 'Can't drop items'. Disabling that option should provide a temp-workaround for players running into these issues. For the crash when sleeping bug - many players have reported that moving all inventory from their fridge into a new chest before sleeping has resolved this. Either adding or removing an item from your fridge or adding/removing an item from your chests should resolve the cause of this until there's a fix in place. @tccoxon has provided a quick explanation of what the cause of this bug was if you're interested in some technical details. Update: The patch has been submitted to Nintendo for final review. All issues marked (Submitted) are included. Daknyf, Kirty!, paperstarships and 2 others like this. Thanks for posting this list Katzeus. Ragarding the Looping Music bug - it happens so often that in order to reproduce it somebody on your team just needs to play the game for maybe half an hour or so, then try the PC version and you'll hear the difference (or, better still, vice versa). People who are used to the PC version are more likely to notice the bug in the Switch version, but even if you've not played it on the PC the bug is still notceable when you are aware and listen for it. Remember that part of the problem is that music even sometimes plays late into the night (when outside) and that shouldn't happen. GardenTiger, ethanmaxcraft and Typhoon like this. "A temporary fix for the Audio cracking glitch is to set the sound in the Switch system settings to "Mono." Please be aware that there are two separate audio settings on the Switch, one for handheld mode, and one for docked television output. Be sure to set the correct one or both for your playing preference. This fixes 95+% of the audio crackling. The remaining occurances of crackling is when you switch between docked/handheld mode. This implies there are two entirely different audio crackling glitches; one which only comes out of the right audio channel which occurs randomly and is removed by going mono, and a separate one associated with docking/undocking that is in the left audio channel which causes it to still happen in mono." Question for @Chucklefish or @Katzeus - are you aware of BOTH instances of the audio crackle bug as outlined above? My game crashes every time I went to bed after mining during the Winter. If I put all of my ores in the chest before bed it won't crash. Tomkingno and Typhoon like this. "Just got a glitched quest. Lewis is asking for a Catfish, so I caught and gave him one, but it only registers as a gift. Pretty annoying." "I have only had two glitches so far. One is that crackling noise, the other is for some reason everything I tried to do kept pulling up my crab pot that was on my farm, no matter where I was or what button I pressed." "I couldn't seem to find any posts or info on this bug I've encountered in the switch version. In a couple scenes, particularly the 8 heart and 10 heart scenes with shane, the camera seems to get stuck panning into the scene. The result is the the scene plays out off-screen while the camera stares at an empty room/section. The scenes complete and everything resumes as normal, but it was pretty disappointing to miss the non-dialog bits of those scenes because the camera was off looking elsewhere. Has anyone else seen this in other places? Is it a known issue?" "The ten heart Harvey event was broken for me. The camera scrolled up past the balloon and off the map while I was docked." For me it's upgrading my copper watering can to silver. What's the date in your game? Someone made a good point that it's mostly happening during/after summer of year 1. For instance, it's happening to me on Winter 1 year 1. I'm thinking it has something to do with accumulated items, seeing as comparing the clearing inventory fix and the time period of the crash happening. I completely agree, I guess the programmers are also thinking along the same lines? 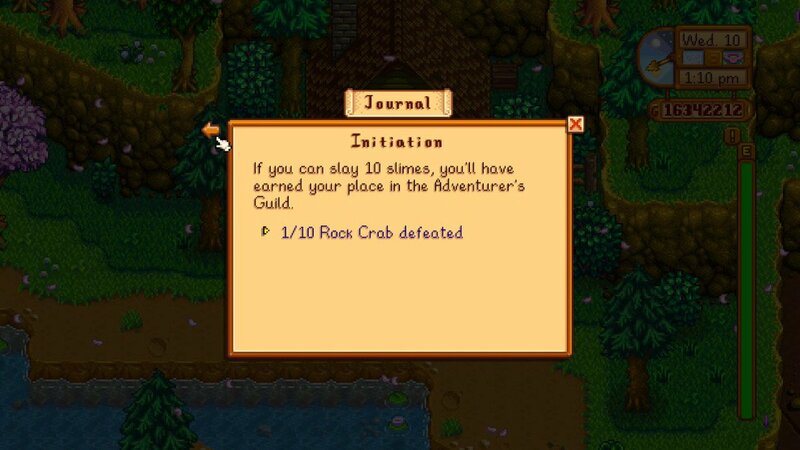 "I have also noticed a bug where when I go to sell some fish to Willy, and the cursor shifts from his list of items for sale to my items, the cursor will disappear. Simply pressing "B" and talking to him again fixes it!" For me the issue began in Spring of Year two, but i had not attempted to upgrade the pick to iridium in winter because of funds. "It's too bad they don't have the main menu freezing bug on their list. It happened to me today each time I tried to load in and then again after I restarted my console so I googled it and it's an old bug. The workaround is manually set your console's date to any time before October 2015 and then it stops freezing. Supposedly if your system clock goes back to the current date it will happen again though." "Joycon controllers become unresponsive and the cracking noises are the only bugs I have noticed. My issue with the joycon is that my character will keep walking even after I let go of the left stick. It's no biggie, but somewhat annoying." I'm having the sleep crash issue now as well. I will try to be as absurdly detailed as possible to help track down the issue. My character is named Renée and is female, my farm is named Mayhill. It is a basic style farm. My cats name is Meow-Meow. My farm consists of a 12x12 plot of cranberries, a 6x12 plot of pumpkins, a 3x3 plot of Sweet Gem Berries, a small coop housing one white chicken named Juice Box, and a small barn housing a single white cow named Ice Pop, both barn an coop have a single chest holding extra fodder, a Silo about half full of fodder. A storage hut containing four furnaces, four kegs, a recycling machine, a preserves jar, a mayonnaise maker and a single chest about 3 quarters full containing ore, metal bars, Quartz and fire Quartz crystals, and other non-food things I use in the machines and their products. My house has been upgraded once and containes 6 chests full to varying degrees with things I've collected including crafting materials, gems, rare items, equipment and food. My fridge is full. The southern half of my farm is mostly overrun with trees and the meteor had landed in amongst them, I haven't broken it open yet. All of my tools are iron quality except my watering can which is gold, and my pickaxe which I gave to the blacksmith to upgrade to gold quality and forgot to retrieve. I have at least 2 heart levels with most of the town for heart with 5 or six people, and 10 hearts with Penny though I haven't married her yet, I have the mermaid necklace which is sitting on the table in my house. I have been as deep as level 97 in the mine. My day started with checking the weather, fortune, and living off the land segment on the TV. Weather's report for tomorrow was windy, fortune slightly positive, and the living off the land segment was about giant crops. The weather today was windy, I tended my fields, my cranberries were ready for their first harvest of the season so I collected them, I set aside 15 unstared berries to turn into wine and dropped the rest in the shopping crate. I watered my fields, then tended to my animals who where each outside in a fenced in portion in front of their respective buildings. I returned to my house where I prepared an omelet and a fried egg. I ate the omelet and retrieved a bottle of blueberry wine from a chest. I left my house, collected an apple from a tree, then headed to town. I went to the community center and donated the fried egg, wine and apple to their respective bundles, I then went to the forest and fished in the river until about 9pm catching about 5 each of salmon, small mouth bass, and Chub, all gold star. From chests I got mostly bait, but I did get a diamond from one. I was using an iridium rod with a dressed spinner, and regular bait to fish. During that time I also stopped at the abandoned house and bought a pair of mouse ears which I equipped. I returned to my farm, shipped the fish I caught and went inside. I went to my bed, the dialog came up asking if I wanted to sleep for the night. As soon as I selected yes, the system error message came on screen saying there was a problem with the software and that it would be closed. My second attempt on the day went pretty much exactly the same except that I didn't make omelet, and opted to walk around the map collecting wild grapes. I gathered just shy of 200 wild grapes and shipped them, I did not buy mouse ears o. Once again, after returning to bed, the game crashed as soon as I selected the option to sleep. My third attempt was just harvesting my cranberries, watering my crops, tending to my animals and going right to sleep. This time there was no crash and I proceeded to the next day. On the following day I tended to my crops and animals, prepared a fried egg, retrieved the wine and collected the apple from the tree. I took the bus stop mine cart to the blacksmith and retrieved my pickaxe, then donated the items to the community center. I then went around the map collecting wild grapes, shipped around 200 again, then went to bed, again progressing to the next day without issues. is sitting on the table in my house. I have been as deep as level 97 in the mine. My second attempt on the day went pretty much exactly the same except that I didn't make omelet, and opted to walk around the map collecting wild grapes. I gathered just shy of 200 wild grapes and shipped them, I did not buy mouse ears or fish. Once again, after returning to bed, the game crashed as soon as I selected the option to sleep. I hope this helps track down the problem. aaeonfox55, Katzeus, Typhoon and 2 others like this.